On a Friday night in Philadelphia, what would be the second-ever "stadium motocross under the lights" was actually the Philly round of the Trans-AMA Series at the old John F. Kennedy Stadium. (Two days later, there would be another Trans-AMA round in Copetown, Canada!) The winner was Maico rider Gerrit Wolsink, a dentist in real life, followed by his teammate Adolf Weil of Germany and Dutch transplant Pierre Karsmakers. Time Hart of California finished fourth. Click here to read more on this all-but-forgotten race. The Trans-AMA opener at Road Atlanta was won by Bultaco-mounted Jim Pomeroy. The 250cc Grand Prix contender had just returned from Italy, where he became the first American to win a moto at the Trophee des Nations, as well as the first man ever to beat all three world champions in the same race (125cc #1 Gaston Rahier, 250cc champ Harry Everts, and 500cc leader Roger DeCoster, all three of whom were on Team Belgium). 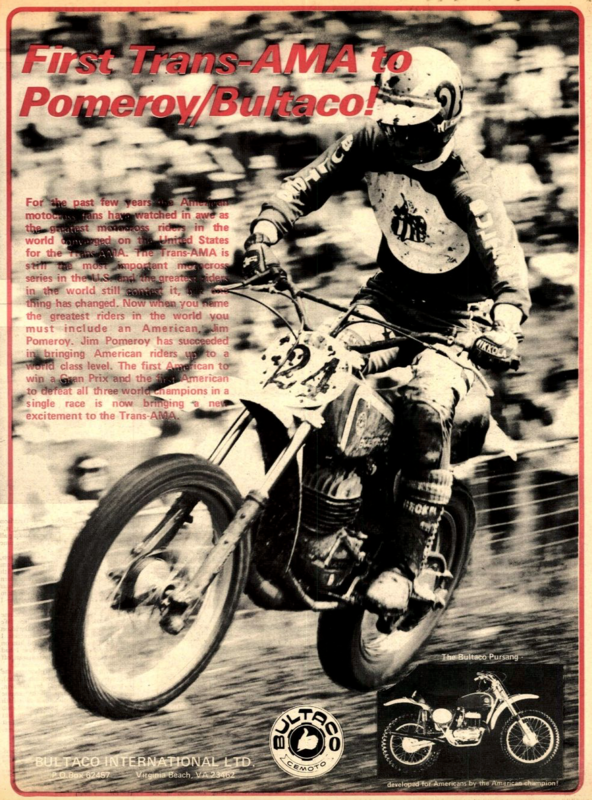 DeCoster was also at Road Atlanta, and he went 4-1 to Pomeroy's 1-3. Team Honda's Marty Smith was third with 4-3 scores, while Brad Lackey went 2-6 for fourth overall. RedBud played host to the second round of what was then called the Trans-USA Series, and the overall winner was three-time AMA 125cc National Champion Broc Glover, who afterward told Cycle News' Tom Mueller, "I've been trying to prove that I am a 250cc rider." Glover went 2-2 to grab his first outdoor overall on a 250, with the Trans-USA Series having dropped from 500s to 250s at the request of the manufacturers. The moto winners were Glover's Yamaha teammate Bob Hannah and Kawasaki's Jeff Ward. The 2014 FIM Motocross of Nations was held at Kegums in Latvia, and the French were victorious, beginning a winning streak that continues to this day. French Kawasaki rider Gautier Paulin won the first moto over Team USA's Ryan Dungey, then Belgium's Kevin Strijbos won the second one over French MX3 rider Steven Frossard. Team USA's MX3 rider, GEICO Honda's Eli Tomac, ran 6-3 after having to come from behind in both of his races. As for Dungey, he did not have a good day and ended up 11th in the last moto. And neither did our MX2 rider, Star Racing Yamaha's Jeremy Martin. He struggled in Latvia after breaking his foot in the qualifying race the day before. The French rider 250cc rider was Dylan Ferrandis, just as it is this year, but back then he was on a Kawasaki. Belgium would finish second, Team USA third. Finally, happy birthday to former Suzuki factory rider Erik Kehoe, an AMA 125 National and 125cc U.S. Grand Prix winner and now the manager of Team Honda.